In this episode of Exploring Different Brains, Harold Reitman, M.D. speaks with Anlor Davin, author of the book Being Seen. She has a truly harrowing story of growing up with undiagnosed autism in France, and overcoming extreme adversity to become a world-renowned advocate for those on the spectrum. 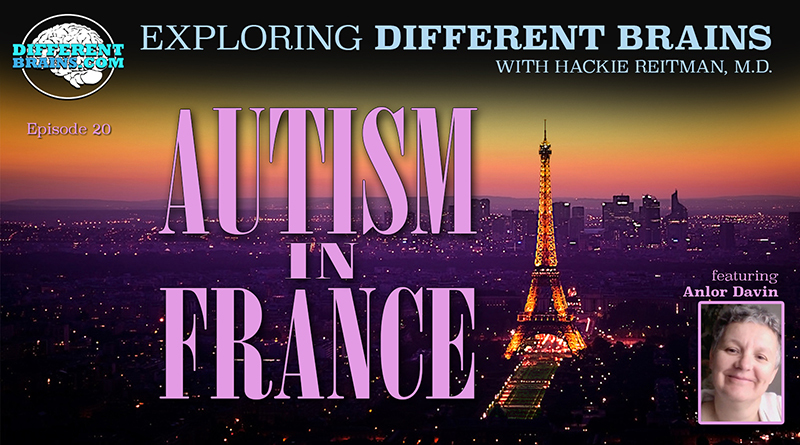 Anlor discusses her amazing story, the difficulties with late-in-life autism diagnoses, the challenges someone on the spectrum can face when raising a child, and the state of neurodiversity acceptance in her birth country of France. Look for her book, “Being Seen,” on Amazon.com, Barnes and Noble, and anywhere books are sold. Hi this is Doctor Hackie Reitman welcome to another episode of Exploring Different Brains and today all the way from San Francisco we have Anlor Davin who is gonna tell you her story about all that she does and her new book and how it is being autistic herself, being a mom, and she’s going to tell us about all of her adventures because she comes originally from the land of France. Welcome Anlor. Thanks for being here. Let’s have some fun. Start out by introducing yourself to our audience. Well my name is Anlor Davin and my memoir “Being Seen” is a memoir about an autistic mother, a French immigrant as you said and a Zen student. That’s me. Of course. Well we may have trouble communicating because you have a French accent and I’m from Jersey City originally. So I don’t know if you can understand me, so you know . Yeah I hear some accent there indeed. Now you are a real student of Zen meditation aren’t you? Yes I would say that. How did you get into? Well fifteen years ago I came to California from Chicago and that’s when I landed at Green Gulch Farm which is a Zen center a bit like a monastery. I was searching for you know what was going on with me, so meditation sounded like something that might be a good idea and indeed it is. I can’t tell you how it has helped my life. I am alive because I think of that you know. Wow. Now let’s go back a little bit further. You grew up in France you were autistic but you didn’t know it. You didn’t know it. You didn’t get diagnosed until you were forty six. Even though you look younger than forty six now. Now what was it liking growing up with autism and nobody knew you had autism. What was the story? Well it was difficult very difficult. I am lucky because I had several passions as I grew up very you know autistic-like passions and I’m really fortunate that my father who I suspect was himself on the autism spectrum gave me one of his passions and that skill is tennis. So when I grew up I became very skilled in tennis which was kind of a barrier if I may say between people you know thinking I was very odd and crazy and wanted to you know put me away but also is very good in tennis. So you know. You were so good in tennis you were in the French Open, is that correct? Oh yeah well, yeah that is correct, however I have to tell you the truth is it was a one time thing at the preliminary and I was very quickly beaten six zero six zero. This is just to say you know that I play tennis. Now what were your autistic characteristics you might say then that you no longer exhibit now if there are any? Well I still exhibit a lot of them if you dig down I mean the thing is I feel like there’s like a certain age there’s like hormones kicking so for example I was very passionate indeed with certain things like very focused and you know I was a child I don’t think that any really disappeared ok no that’s not true I had some stimming habits like with my thumb that I never do that is true anymore also let’s face it I was not yet understanding all. The sensory stuff obviously bothered me very much but I was not so understanding that it was a big problem for me. So for example my dad would wear cologne from time to time not very often but when he did I sure noticed it, but you know I was a child and it was different and I thought I liked it, in fact, I know better now I know that those smells just give me terrible headaches and I don’t like them at all. But I did not know then that at the time. Does that make sense? Yes it does, the hyper senses which you know most people are ignorant that people whose brains are a little bit different whatever their labels might be but let’s take the autism label. I did not know that my daughter, Rebecca, who I didn’t know had Asperger’s and I didn’t know that all of her senses were hyper. So I used to thought I would get her attention by talking loudly, not knowing I was driving her crazy. And I didn’t know that certain sense, certain touch, certain feel, lights and of course she has epilepsy too so the lights were a big problem. I didn’t know when I took her into a public supermarket that she could hear the fluorescents and see them flickering and drive them drive her crazy. And there’s the movement too. You know I also at that age got some epilepsy too, when I was a teenager. You probably think I’m very different. No, no I you see the way I’m seeing neurodiversity, I’m seeing that the whole of neurodiversity of different brains is greater than the sum of its parts. I don’t see anything occurring in isolation. And it’s precisely because I’m a novice who’s new at this accidentally getting into this, that I’m able to connect all of the dots and say “Wait a minute, nobody is strictly autistic, or strictly epileptic or strictly anxious or strictly PTSD they all overlap, and actual anatomical wiring in our brains is different so that’s why I named our company and our website “Different Brains” differentbrains.com because I don’t want to alienate anyone I want everyone to feel welcome and labels are okay if they help us do something, but I’m not a big fan of them because everything overlaps and if I love the saying “If you’ve met one autistic person, you’ve met one autistic person.” Now let’s take you. You’re about as individual as you get okay? I think if we look up in the dictionary let’s find somebody with autism who played in the French Open who came here from France and then worked in the very violent areas of Chicago we’ll get into in a minute then ended up in San Francisco. Tell us about the job you had teaching in the South Side of Chicago. Let’s go back there. Yeah that was quite something I’ll tell you. So first I want to say that my I’m quite autistic with my job history many ways meaning it’s very spotty, I never had a job that lasted more than maybe a year and a half I mean not that I was ever fired but they always found reasons you know, I guess I was odd. So when I was in Chicago, so I ended up with often difficult stuff and sure enough I ended up teaching in the South Side of Chicago and boy well it was something to find other people who had a really really tough time too you know who are very different and had a you know significant challenges I mean I just feel for the kids that I so it was just some teachers would say that I would be too you know I would buy too much into it but you know maybe on some levels just I acted a different way however I mean the stories that those kids told me ok maybe some of them were made up but let me tell you not all of them were. You know we interviewed Jim Sporleder who went into the schools of a very very tough school out in Washington and thought he was going to put in law and order and everything and he evolved into the trauma and informed method where he would say to the kid “tell me why what happened? Tell me what happened why are you acting like this tell me what’s going on? And he’d get an earful and it’s not an excuse or anything but it’s a way of approaching the problem and we see that at the Hackie Reitman Boys and Girls Club here in Fort Lauderdale at Martin Luther King and Broward Boulevard and these kids are good kids who come there who don’t have parents for the most part many of them don’t have one parent and it’s tough it’s tough and we’re very proud we have a ninety percent high school graduation rate and the kids do well but we have to, the kids who want to be the gang bangers and not leave their beepers and not give up their colors we have to not bring them in the mix you know which you don’t have that option in a public school and I’m getting off on a tangent cause now let’s shift from teaching in the South Side of Chicago with undiagnosed autism and now you move out to San Francisco. What was that change like? Oh gosh that was the best for me. I really feel like I had arrived you know to like a somewhat safe harbor I was becoming more and more ill. I told you if I feel like it’s a hormonal thing in my book I talk about the phases that one goes through when I feel one is autistic there are like phases if you make it through teenager years I felt oh wow that’s a good one and then then you’re gonna have your adult life and then you’re going to get pre-menopausal which is what was coming on me at that time and Hackie those sensory things became worse and worse my sensory problems I mean everything started to be very difficult for me more and more so when I arrived in California I was trying to figure what to do what was going on with this and so like I told you I went to sit for six months at that Green Gulch Farms which is Soto Zen which required a lot of sitting and it basically at the time it’s like you got to have faith. I saw people who had been doing it for a long time who had been practicing Zen, Soto Zen for a long time and that gave me faith, because obviously it has an effect and so that was the only thing that made sense for me because I could sit even when I left Green Gulch I could do it at home. It did not cost me money because I had big financial problems. It did not require many sensory things because at least I was at home and I could keep it dark and I could keep it quiet depending of well it’s not all that quiet you know when I was like this even inside my apartment all the you know noises background noises I would hear them very much but you know I have often earplugs and I have a whole set of head gear but I kept sitting I kept sitting I kept sitting Hackie and first a little bit every day and more and more and more and guess what, my life slowly came back on track. You know everything I feel stemmed from there. Does that make sense? You have all the sense in the world it really does that the Zen meditation was for you what I refer to as a chapter in Aspertools that was your safe place. That was a safe place. And you were relaxed and you would sit and you would clear your head and you would keep the sensory intake to a minimum. Did you play any soothing music or anything like that? Oh no at that time Hackie, soothing music was too much. At that time. Now how did you get diagnosed with autism? Ok well actually believe it or not a lot of my Zen friends helped eventually ok so I have a son that’s very important I don’t know if I mentioned that who is now twenty-four and when I was becoming so very ill it became impossible to take care of him. So he left and I started to be able to have more at that time I no longer had much strength really I was ill I was really in bad shape. I could not go out but because my son left that kind of helped me have some room for like more because I have a physical problem in my neck and spine so when I was alone at home I could massage it and do various you know therapy and stretches for it so that started to help also my Zen they always gave me scholarships that allowed me to go sometimes to their event where it was very difficult with the noise and everything but they would not understand why I needed a room by myself I mean I was not diagnosed yet. So anyway because of my son too I had Welfare and Welfare did not believe me either nobody did. However one time I fainted in front of a case worker so they smelled a rat and they decided ok we’re gonna help you so the traditional medical clinic could not figure out what was going on either but thanks to Welfare I was able to start to receive Social Security. Eventually though Social Security two years later you’re automatically enrolled in Medicare. Is it Medicare? Yeah Medicare. And when you have Medicare you can actually see specialists and what happened was a Zen friend of mine took me to see a very good neurologist and there I was diagnosed. So from then on everything changed. Tell us about your son and your first husband back then. What were the circumstances for all of that because you were autistic you didn’t know it you were having issues and you got married or not I don’t know did you get married. Yeah I was married for a few years. And then so he got custody of your son? At that time? Actually we got joint-custody however what happened indeed was I had to leave my son with his father when I came to California for the first three years I was in California I did not have my son. Having a child for an autistic person is very very very difficult. The sensory things I mean once my child was born the child was screaming, the smells I mean I love having a son on the other hand, listen I did not kill myself because I had a son that was a really strong anchor and I love my son to no end you know autistic not autistic it’s the same but I just had to leave him with his father when I came here in 1999. September 1999. Now are you on good relationship terms with your son now? Yes he doesn’t live far from here Martin yes we are on good relationship terms. We see one another quite regularly and we do things like he moves around a lot so I get his mail so I have to tell him a lot about and I help him a lot with his mail taking care of it. Well that’s a good question what does he do? Does he have autistic traits? Well I would definitely say so, but he doesn’t identify with it he doesn’t want to and you know what Hackie? I totally understand this. You say you have a daughter and you know like you said being labeled is difficult I mean once you’re labeled you get into a lot of people who right away assume they’re better than you and then there’s the financial aspect I mean when you go for a job it’s a tough one. If you tell the job person that you know you’re autistic it’s getting better Hackie the assumption obviously there are people many autistic self advocate like me who are coming out and telling the world hey we’re not such morons you know? But it’s a hard one, okay? No it is, and what I want is for the educational system and the employers to just be able to say look we’re glad to give you a little bit of help you need or an accomodation because you have valuable gifts and you have valuable talents and that can be at any level that can be out where you are out in San Francisco, for Google, or Microsoft or Apple or someone who works on an assembly line and loves paying to detail doing the same thing over and over, whatever the job is and I think we all need to be able to try to get a job and maximize our independence. Oh yes. I’m totally with you, totally with you. I mean the whole financial job thing it’s so vital I mean without that you can’t function. You know? It could be you, it could be me, it could be anybody. You know we need to be able to function. Now, tell us how did you get into writing your book? Tell us about that, Being Seen? Yes, Being Seen. When I arrived to California sixteen years ago I became as I said more and more ill and unable to function and I wanted to talk about what was going on with me to people but then people did not want to hear it and some of them, two of my Zen friends totally in different ways told me you know you should write it down, so I started to write it down and that’s how my book started. Very good, how would you describe your book to give a teaser to our viewers and listeners? Yes, well I decided to go at it in a chronological order. I didn’t want to jump around and I am fortunate that there is obviously three different parts in my life even geographically so I followed those. So the first part of my book is in France twenty-three years, then the middle part of my book is in Chicago, twelve years and then the last part of my book is in California. Nice, so it’s got a chronological and a geographic path. Okay well we will have to read it to see you because afterall it’s Being Seen so we’re going to get to see you when we read that book. Yes thank you that’s exactly the idea I mean it’s not so much to be seen again as autistic but for all of us to be better seen to be better understood and respected. Now do you ever get back to France? Well I recently started, I did not go for a long time there when I was very ill I just couldn’t so for fourteen years I did not go but the past few years yes I have gone back and I am going to go back in the fall of 2016 coming up so yes. France when I grew up and even now, honestly Hackie, finally people were like oh yeah she’s saying the truth France was terrible for autistic people. You know even now France doesn’t have a very good reputation when it comes to autism but I want to say that during our visit in 2014, my partner Greg and I visited a lot of autism places as much as we could and we found that there is hope that obviously France is trying to catch up with the whole thing and that there is very much hope with that. We have different brains all over the world for sure. Especially out there in San Francisco, Silicon Valley. You can Greg fit right in there and I’m sure Greg’s another story but we’ll save that for another time. What is the biggest advice you might have for someone experiencing problems in their adult life with autism? What is your advice from Anlor Davin to say to somebody, what would that advice be? This is a tough question because I feel like there is no one thing you know it’s many things. I don’t want to sound like a proselytizer but I feel like for everybody, not just for autistic people Zen practice is really something wonderful. Alright if someone wants watches you just saying that and says you know what I want to try that Zen I don’t even know what that is but I want to try that how do they go about that? Well in many cities, more and more there are places where people get together in little Sanghas where people sit but you don’t have to go in a Sangha at first you can also start sitting by yourself in a quiet place cross-legged or however you can but with the back upright and being still for as long as you can be because it’s not magic you know every terrible thing we push away is going to come back up and it’s really really tough it’s like water that has dirt in it that’s really starting to come down, the dirt at first, so keep at it, stay quiet. Is that ok? Does that answer your question? Yes it is and it sounds for myself that last part would be a challenge, being quiet. Now, how does our audience find out more about you? How do they do that? So they will go to your website Anlordavin.com and they can find all the information and about your new book Being Seen, okay? And something about Zen meditation there? Anlor it’s been just terrific thank you very much, another episode here, Doctor Hackie Reitman, Exploring Different Brains, and thank you very much! Thank you too Hackie it has been a pleasure too, very good, thank you. We’ve been speaking here with Anlor Davin with her new book Being Seen. (10 mins) In part one of a special two part episode, Hackie Reitman, M.D. 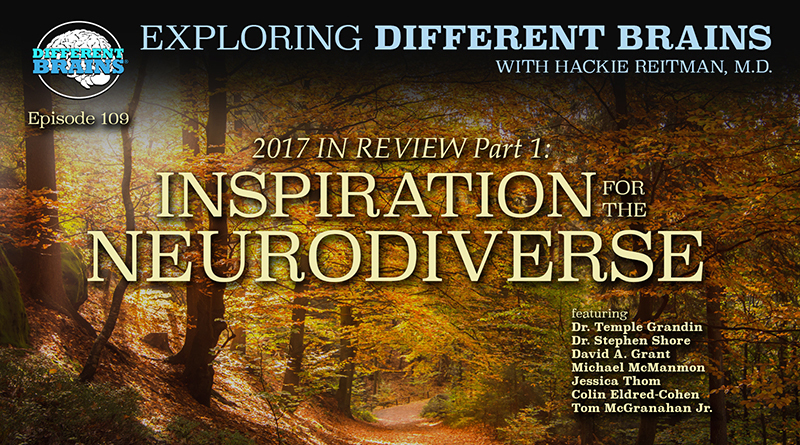 presents a handful of the great neurodiverse guests the show has had in 2017, including Dr. Temple Grandin, Dr. Stephen Shore, David A. Grant, Jessica Thom, and more! 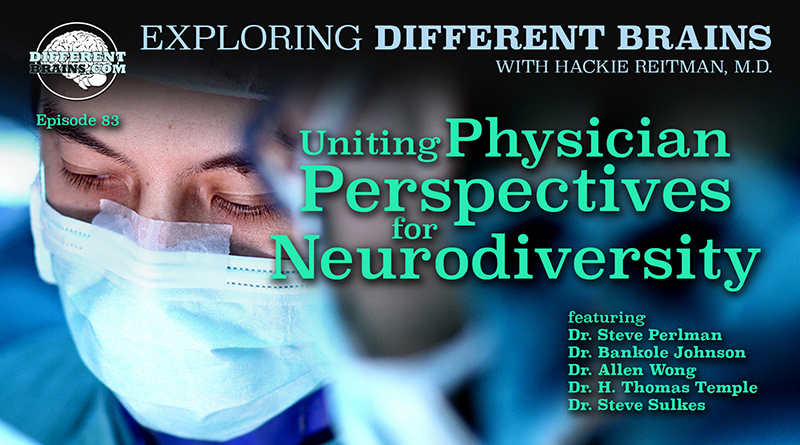 (25 min 43 sec) In this special episode of Exploring Different Brains, Hackie Reitman, M.D. presents five previous guests discussing breaking down barriers in providing quality health care for those of us with different brains. Guests include Dr. Steve Perlman, Dr. Bankole Johnson, Dr. Allen Wong, Dr. H. Thomas Temple, and Dr. Steve Sulkes. 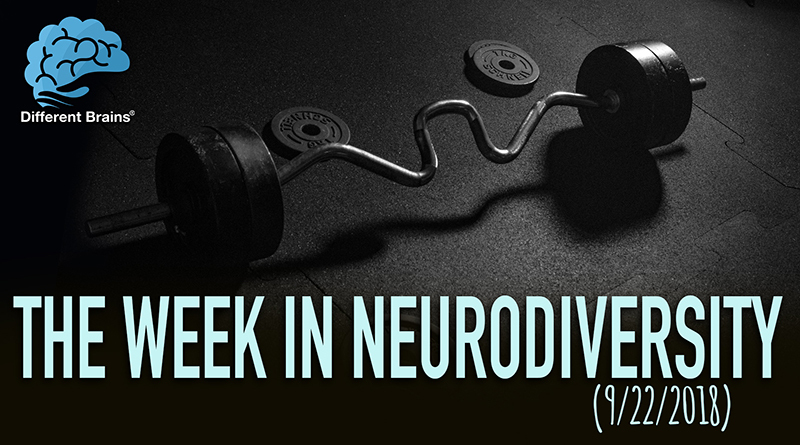 (3 min 16 sec) In this episode, the Philadelphia Eagles get set to launch their 2nd annual Autism Challenge, Stanford launches a concussion education course, and a cancer survivor with cerebral palsy opens a CrossFit gym, and more!